If you want to escape to one of Israel’s best beaches and combine it with excellent cuisine and a bit of Crusader history, then the place to go to is Herzliyah Pituach. 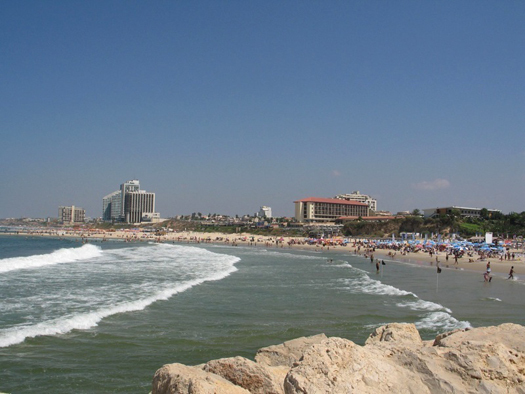 This seaside community, which is also one of Israel’s largest high tech centers, is just a ten minute drive north of Tel-Aviv. 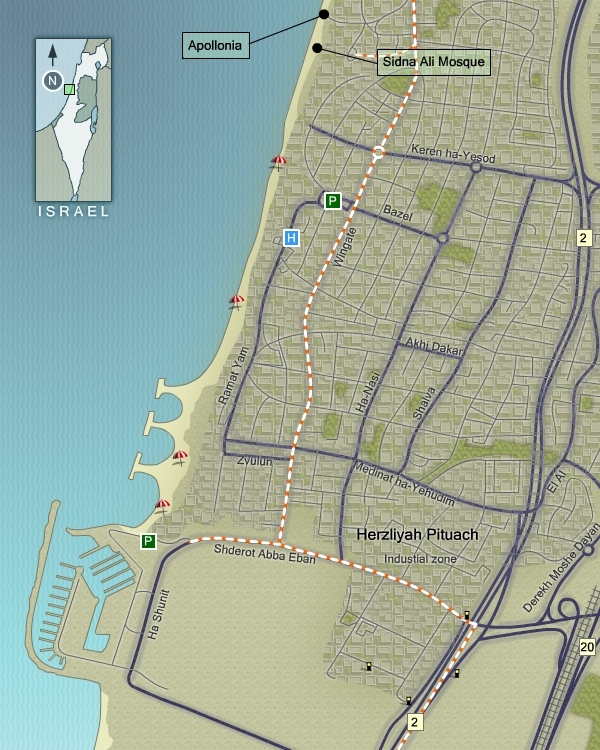 To reach Herzliya Pituach, exit Route 2 at the Herzliyah Pituach exit and proceed west to the open parking lot at the corner of Wingate and Abba Eban St., or to the Herzliyah mall parking lot. There, a pristine, two kilometer long beach is spread in front of you. To some, this beach is one of the greatest attractions in Israel. Walking north to explore this popular stretch of the Mediterranean will bring you to the archaeological site of Apollonia National Park. However, some visitors may just wish to relax at the waterfront where an umbrella and some chairs can be rented and a drink can be enjoyed. Even a typical Israeli breakfast can be had at one of the many waterfront restaurants right on the beach. What a perfect Israel vacation! After several hours of basking in the sun, visitors can shower and use one of the new changing rooms at the beach before heading on to explore the Herzliyah Pituach mall. There, you can enjoy a wonderful alfresco lunch or dinner with such choices as sushi, Italian, or Greek cuisines, and always excellent fish, while taking in the views of the sailboats and yachts docked at the harbor. The afternoon can also be spent renting a boat with a skipper to explore Israel’s coastline. Many charter companies post their names and phone numbers on their boats, but note that unless you can gather a group to share the cost, this could be an expensive proposition. If you are not the seafaring kind, but would rather soak in a bit of history, walk north along the brand new boardwalk and beach for about 30 to 45 minutes or drive to Apollonia, following the brown directional signs on Wingate Street. Driving will of course permit you to venture into the elegant side streets to view the numerous ambassadorial residences in this diplomatic community. Some of these homes are easily identifiable by their national flags or emblems on their gates. A short drive to the left of the main gate to Apollonia stands the tall minaret of the Sidna Ali Mosque, the main feature of the Sidna Ali National Park. The mosque is open daily for a visit to its prayer halls, but requires modest dress. On Fridays, Arab worshippers arrive by charter bus to worship at the shrine, which was built about 800 years ago to venerate the Arab warrior Al-Hasan Ibn Ali. Tradition has it, that Ali, a lieutenant to the Sultan Biebers, fell in battle against the Crusaders, at the spot where the mosque is located today. From there, drive back to Apollonia National Park, where you can continue your Israel tour. Apollonia is located on a kurkar promontory overlooking the Mediterranean. On a clear day you can look south to Jaffa or to the north toward the high rises of Netanya and beyond. Looking down into the shimmering waters of the aqua colored sea one can easily make out the outlines of a former harbor as well as the remains of the early Islamic period wall that had fallen into the sea many years before. The natural harbor was used at the end of the 6th Century BCE by the Phoenicians, Apollonia’s earliest settlers, who harvested snails to produce a purple dye later used in the making of religious and royal garments. The Phoenicians named the settlement Arsuf, and later the Greeks renamed it after their God Apollo. Immediately upon entering the national park you can observe a well preserved portion of the crusader moat, and immediately beyond, the remains of a Roman villa, whose inhabitants no doubt enjoyed its unobstructed views of the sea. Time permitting, you may wish to follow the sea path route, rather than the more direct walking path to the crusader fortress. Walking along the ridge, note the Byzantine cistern, water reservoir and stone lined pool, both of which were part of a sophisticated system that supplied water to the inhabitants of the then 70 acre city. These are the only remnants from the heyday of Apollonia of the 5th and 6th Centuries CE. At that time, the city dominated the coastal plain and was known for its glass manufacturing, its port, fishing industry and oil and wine presses. At the end of the sea path trail enter the imposing crusader fortress, whose walls are surrounded by a 30 meter wide and 14 meter deep moat, the largest in all of Israel. The crusaders conquered the city in 1101 CE and renamed it Arsour, but it was not until 1241 CE that the fortress was constructed under the leadership of Jean d’lbelin d’Arsour. 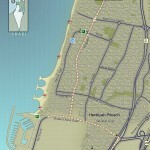 Subsequently, in 1265 CE, the Mameluk Sultan Beibars conquered Arsour. One of the most impressive surviving structures at Apollonia is the two-story inner gate of the fortress, which is reproduced on the seal of the crusader nobleman, Seigneur Belian 1st, whose residence was at Arsour. Then proceed to the observation point of the keep, which was part of a 30 foot high tower and try to imagine the crusaders attempting to defend their fortress against the approaching Mameluk army with its massive siege machines. The 2200 large ballista stones displayed at the site, and the remnants of a fire in the Burnt Room, are a vivid reminder of the ferociousness of the 40 day battle that ultimately destroyed Apollonia. Immediately, to the north of the fortress, recent archaeological excavations uncovered a beautifully preserved wine press surrounded by a mosaic floor. If visitors are fortunate enough to travel to Israel during the summer, they can enjoy an evening of live music under the stars in the Apollonia fortress’ courtyard. The national park should have a concert schedule at the front gate. At the conclusion of the visit, you can return to the beach via a nearby path to enjoy the sunset from a seaside bar. There’s no better way to end a day of travel in Israel!